Facing the coastline and ocean surrounding St. Bart’s, Ti Agave Villa provides a perfect place to escape and enjoy a vacation for one or two. This one-bedroom villa is close to both the L’Orient and Marigot beaches, but is private enough that you will be able to relax and enjoy the views from your deck in peace. With air-conditioning throughout every room, a private pool looking out over the water, and a glass window sitting area looking over the deck, Ti Agave Villa is an ideal destination for your vacation to St. Barth’s, with views to spare of the hills and water below. Located on the hillside of Camaruche, Ti Agave is a very nice weekly home rental offering one of the greatest views on the island. 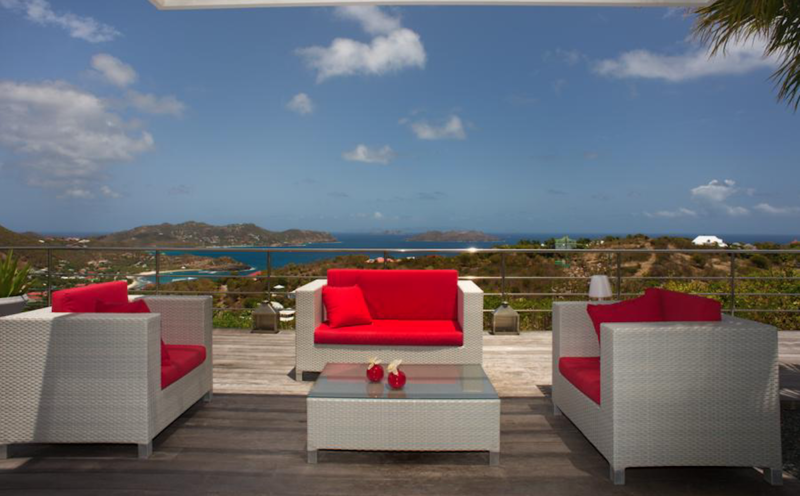 It has a large deck and pool overlooking the ocean with a spectacular view of St. Martin, Forchue, Bonhomme, and Fregate islands. This brand new, contemporary one-bedroom villa takes advantage of a lot of sun, offering amazing sunsets. Ti Agave can be rented with the neighboring villa, Agave, for a total of three bedrooms. Close to Lorient and Marigot beaches!